Just had my first ultrasound yesterday. They didn't say that this was twins but do want me to come back in 3 weeks. They said that it's just too early to see everything they need to. They also told me that the 'spot' on top was the baby, but what is the spot on the bottom? Is that the yolk sak or could it be twins? What do you think? Hi, I guess I'm about 12 weeks now but I got an ultrasound when I was about 3-4 weeks and only one sac seen at the size of 19.77 mm and in an oval shape but now my belly is way too big than any of my other pregnancies and I never had two babies at one so could it be twins? we just found that we are having definitely having twins, but it may also be a 3rd baby as well. I am so excited! 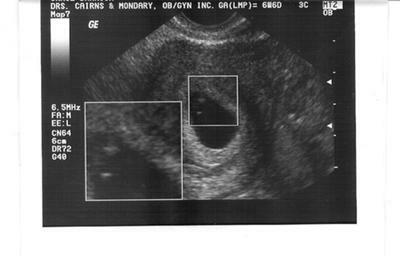 Return to Ultrasound Pictures Of Twins. Information on this site is not intended as actual medical advice. Please consult with a physician or other healthcare professional with health questions and/or concerns.